During the summer season, one of the most enjoyable activities is barbecue grilling with the family. However, it will be better to consider a number of safety precautions first before undertaking this activity. Accidental burns concerning embers or heating components of an gas grill is one of the most common, albeit minor, accidents one would experience when grilling. In order to avoid this, the person in charge of the barbecuing should equip himself with the necessary personal protective equipment such as heat resistant oven mitts, tongs with long handles, and reliable matches or lighters. Loose or baggy clothes, especially those with hanging sleeves, are not advisable to be worn during this activity because it can easily catch fire. The grilling equipment should also be positioned in a place that can not be easily accessed by children and pets. This is to prevent accidental bumping which can cause burns or even cases of fire. As much as possible, barbecue grilling should be done at least 10 feet away from home. Also, trees should be avoided as these can be easily caught by fire which is due to dripped grease and fat in the foods being grilled. Another place that is not safe for barbecue grilling is the garage or one that is near the storage area of flammable objects such as propane tanks and aerosol cans. Thus, having a fire extinguisher is one way to minimize the risk of fire accidents. When barbecuing, it is very important to be alert to what is going on around you. Children near the grilling area can be particularly dangerous. The grilling area should not be left unattended because otherwise, children playing nearby can come in contact with the hot grill and can be severely burned. That is why it is best advised to prepare everything that will be needed in the grilling activity before starting to heat up the charcoals or turning on the gas grill. Meanwhile, it is also very important to refer to some instructional manuals if you do not have enough knowledge or experience in barbecuing. This could be a great help especially if you are having a hard time grilling or if you are unable to get the desired outcome. The user manual of the barbecue should also be used to learn tips as well as safety precautions that may help bring an enjoyable time grilling. For families living in an apartment or in a building unit, conventional grilling is not advisable. 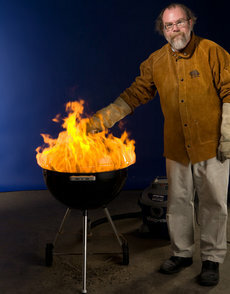 In its place, however, an electric grill can be used if you want to do some barbecue grilling indoors. In addition, it is a good idea to ensure that a fire alarm system inside the house or apartment unit is working efficiently if indoor barbecue grilling is done often. Article sponsored by Housecall Property Inspections, San Diego's premier home inspection company. To learn more tips on how to have a safe and enjoyable summer, visit their blog at http://www.sandiegohomeinspect.com/blog.